It’s that time of year again… tax time. I am reminded of this as I prepare my own tax returns. There are two options on your tax return forms that pertain to politics. Both allow you to designate money from public funds to election campaigns. Neither of these actually take money from your tax return. The first allows you to designate $3 toward the presidential election campaigns. This money is used to match money raised by eligible presidential candidates. 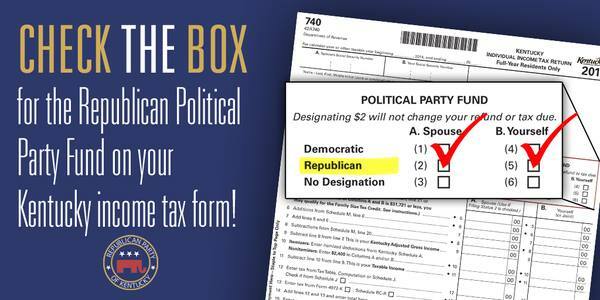 The second is $2 toward the state political party of your choice (Republican, Democrat or no designation). The McCracken County Republican Party would appreciate you designating $2 toward the Republican Party. Again, this money doesn’t come from your refund. A portion of that $2 actually goes to us, the local party. We use that money to help our candidates during election time. We help pay for ads in local newspapers, local billboards, local radio ads, flyers, etc.. Please consider designating $2 toward the Republican Party. I am. Thank you!